movie The movie is in .mov format; about 10 Mbyte. 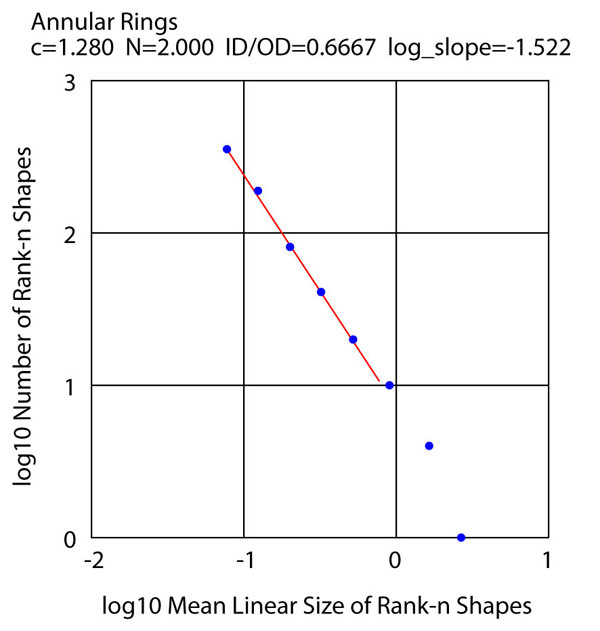 The chart gives a log-log plot of the population of each rank versus the mean ring linear dimension for the given rank. The data is close to a straight line, indicating that the ring rank populations obey a negative-exponent power law with negative exponent value approximately 1.52. The rank populations thus have a statistical distribution which many would call "fractal". One object was to demonstrate the space-filling property. To this end a c value close to the upper limit was used, resulting in a final image with 82% fill. A total of 27,264,622 trials were made to place 701 squares, for an average of about 39,000 trials per placement. c=1.28, N=2, fractal D=1.56. It can be seen that any available space receives a ring just as soon as the next-ring diameter is small enough to go into it.